Hey, lovely friends. We just wrapped up our time on North Carolina and headed to Virginia today. I lived in VA when I was 7-12 years old and it's such a treat to be back for a few weeks. It is a fantastic place to live/visit. There are a ton of beaches, hiking, great schools and people and Washington DC is my favorite cities for museums. I thought I'd share a wuick little project that will have major curb appeal! 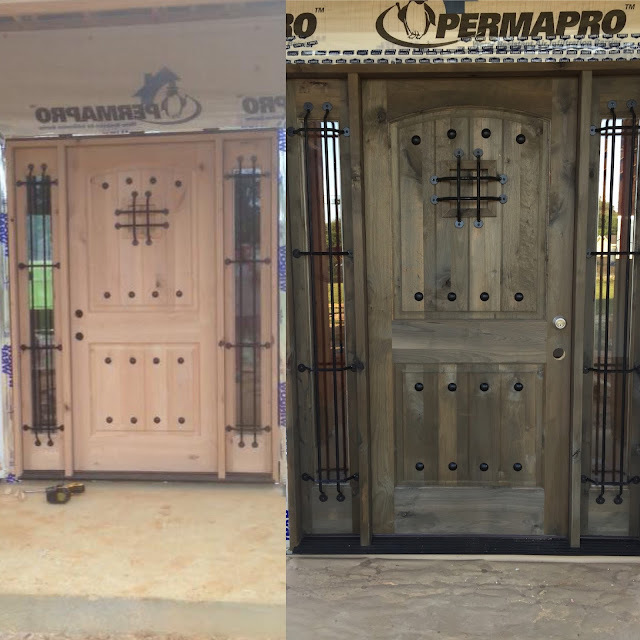 This front door was taken from brand new raw wood and turned into authentic looking Barnwood! Let's talk about how to get the look. 1. Spray/Paint the door with paint thinner. This opens up the wood grain and prepares it to be stained the same way facial toner opens your pores. 2. Strain the Reclamation stain and then use the gravity sprayer to drench the wood. Spray the wood evenly and allow the stain to air dry. (See top video). You can also use a brush to apply the stain (2nd video, above). Apply and let air dry. 3. Wait a hour for the stain to dry. Spray the Exterior WaterProofer, again drenching the wood and allow it to air dry. Apply up to 2 coats. Isn't it pretty? This is one of the easiest looks to achieve and it has such a huge impact the front of the house. I am waiting to receive a few more photos, once the beams have been stained. We have a ton of clients use our stains on barn doors, everything from custom made ones to cheaper options from Home Depot.